Warming up the crowd in Qudos comes Hypno5e to start, an avant-garde metal band from Montpellier, France. Experimental and progressive, their style is a mixture of highs and lows; powerful and heavy prog riffs combined with harsh vocals and drum beats, and also beautiful melodies with elaborate piano scores topped with movie samples, some in French and others English. With the added cinematic visuals, Hypno5e offer us an enthusiastic performance. Sadly the movie samples in their tracks are somewhat lost in translation – perhaps due to venue acoustics – but regardless they make up for it with their own sheer energy and organic sound as they thrash around on stage, especially during their finale. The dichotomy in their music is very rewarding and even has the crowd reflect that energy and shifting flow from their latest album Shores of the Abstract Line. Fans of Gojira and The Dillinger Escape Plan will definitely enjoy Hypno5e who have a lot to offer. 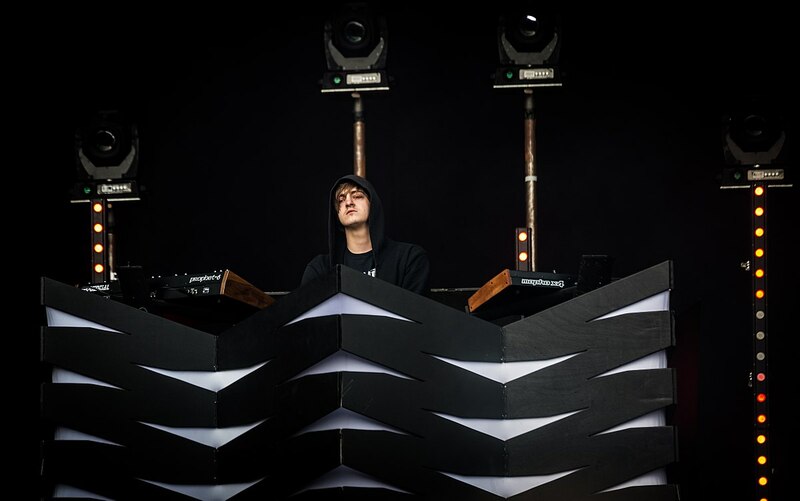 When James Kent – aka Perturbator – enters the stage the crowd erupts as he presides over them like some Sith Lord, his black hood draped over his head. You can hardly see his face, nor does he appear to speak a single word during the entire performance. Despite being a focused musician, though, he rarely stops moving, and as he darts back and forth between his instruments bobbing his head it’s clear that he has an urge to go crazy. Channelled through his music as well as colourful, retro-futuristic strobe lighting, he cycles through tracks covering essentially all of his studio albums. It’s a very diverse set-list, so when fans recognise ‘She is Young, She is Beautiful, She is Next’ from Dangerous Days, or ‘Venger [feat. Greta Link]’ from The Uncanny Valley, they are ecstatic. During the closing breakdown of ‘Tainted Empire’ from his latest album New Model, it’s as if gravity itself is amplified within Qudos and crushes us under the pure oppressive weight of darkwave. An unforgettable performance from the Synth Lord.